Trying to lose weight with PCOS is nearly impossible, or so it seems. Through my 10+ years with PCOS I have been able to control my weight with strict discipline, only to gain it all back at a moments lapse. I’ve finally found the strength and determination to lose the weight and keep it off for good. I tried Metformin and did not lose any weight, all my weight loss has been without Metformin’s help! 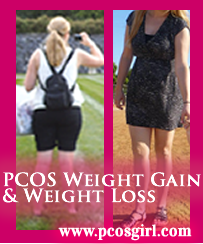 To keep your weight in control with PCOS you have to be determined and give it 100% effort. There’s no room for wishy/washy or non-commitment. I’m finally there, for good! In the past I would get super motivated and dedicate 6 months or so to the task of losing weight. At about the 6 month mark I would start to fall off the wagon and the pounds that took me 6 months to lose came back overnight-literally. When I was diagnosed with PCOS (about 10 years ago) I was roughly 40 pounds lighter than I am today (60 pounds lighter than I was at my heaviest point). I have come to accept that I will never be that small again. Not just because of the PCOS but also age, lifestyle, and having children. I’m fine with this! But I would like to lose another 10-15 pounds. Since I’ve been working to lose the weight for so long I’ve gathered a lot of life knowledge and professional knowledge. I’ve worked with doctors and nutritionists as well as personal trainers. I know what works for my body and what doesn’t. I’ve also made some new discoveries and started using some cool weight control tools! It is HARD to lose weight with PCOS, sometimes I feel defeated! The average person would lose 10-15 pounds doing what I do and I only lose 2. But it is what it is, we just have to work harder. I’ve accepted this. Below I will lay out everything that works for me when it comes time to lose weight! I am not a doctor and everyone is different, so please remember that what works for me, may not work for you. These things have made all the difference in me actually losing weight. Start off every morning with a citrus fruit (orange, grapefruit, mandarin, Cutie, or lemon water) and an apple or homemade smoothie (see ingredients below). Walk or do active cardio for at least 20 minutes every night- about 45min after eating. This made all the difference for me! Eat Organic and all-natural foods. We don’t need more chemicals messing up our hormones! No Milk or ice cream! Keep fast food to a minimum! Stay around 1400 calories a day. Use MyFitnessPal to help you track everything I put into your mouth! Ditch the white sugar! Either do a full ditch or a gradual one- but ditch it nonetheless. See my PCOS Diet article HERE. Eat lots of fish- learn to love it! Swap typical dessert for dark chocolate. Eat lots of veggies, learn to love them. Bake them in the oven with olive oil, salt & pepper or throw them in a smoothie to mask their taste. See my article How to Make Veggies Taste Better. Drink lots of filtered water (skip the bottles as the bottles can leach BPA into your water). Stay within my calorie limit! Going over one day is ok, going over my limit everyday will have me gaining weight! Add ceylon cinnamon to whatever I can! It helps regulate blood sugar. Try ice chips, sometimes you want to eat just to eat. Ice chips are fun and satisfying. Keep bread to a minimum- the less the better. Learn to love quinoa, over a salad, mixed with BBQ sauce- it’s a great and yummy grain! Carry snacks in my purse. Bags of baby carrots or even a healthy protein bar. They’ll detour me from eating junk on the go. No excess cane sugar! Have to ditch the cookies, donuts, brownies, candies- all of it! No nitrates! This is especially important if you’re trying to conceive! Nitrates are found in meats. Look for ‘Nitrate Free’ or ‘No Nitrates Added’. No going over my daily calorie limit. No soda or chewing gum! Both have chemicals that cause you to gain weight!!! No eating late at night! No eating heavy breakfast foods. This includes oatmeal! Surprisingly when I stopped eating oatmeal for breakfast I lost 3 pounds within a week! I realized that it was to heavy for my already slow metabolism. By switching to citrus I was able to rev up my metabolism and start seeing results! Include some items below as well as a daily 20 minute evening walk after your dinner! Elliptical (fastest weight loss results! )- 25 minutes gradually increasing resistance and incline. Always use arm levers! This machine will whittle my waist, define my shoulders, trim my arms and thin out my neck/chest area and face. I swear by this machine! Strength train- do machines that focus on arms and stomach. Leg machines tend to bulk up my legs- no thank you! Rowing machines are great too. Dance in my living room or bedroom. Turn the music up and go crazy- dance continuously for 25 minutes. Jump on a mini trampoline. They help you lose that dreaded belly weight and they’re relatively cheap. Wii Just Dance or Zumba games are great and fun for the whole family. I always break a sweat! Run or walk my neighborhood. Try to find some stairs or hills to train my legs. Anyone have any other tips? Throw them in a comment below and share them with us all! This entry was posted in PCOS, PCOS Weight Control and tagged pcos losing weight, pcos weight loss.